Toyota-Lift of Minnesota is this region’s premier forklift and material handling dealership. Our mission is to improve the customer’s productivity and bottom line through better products, services, and customer service personnel. We complete Toyota forklift sales in the Minneapolis area and also have a branch in the Rochester/Byron region of Minnesota. Our team sells and supports forklifts, aerial equipment, warehouse equipment, material handling supplies, personnel and burden carriers. We are proud to represent Toyota Forklift trucks – the #1 selling lift truck in the world – Sellick, Kalmar, Flexi, Combilift, Taylor-Dunn and Polaris. Toyota-Lift of Minnesota has brought customer-focused service to Minnesota and western Wisconsin for over 37 years. Cost is an important consideration when you’re looking for equipment that will streamline your productivity. Our selection of new and used Toyota material handling equipment provides impressive value for a wide range of applications. Find the products you need at a price that makes sense for your business. Whether you’re looking for a 3-wheel electric forklift, an adjustable walkie stacker or any other Toyota equipment that will help you do more in your facility, we are here to help. In addition to our large selection of Toyota equipment, we offer commercial vehicles from several other equipment manufacturers. Our goal is to set you up with the ideal product for your specific needs. Keeping your equipment in working order requires planned maintenance. Forklifts and other types of material handling equipment feature many moving parts, and for this reason, it’s important to keep a close eye on their condition. Our team can provide you with detail-oriented planned maintenance so you can avoid any unexpected downtime. Providing your employees with equipment training is more than a suggestion, it’s the law. We have developed in-depth training programs that provide your team with the resources it needs to stay OSHA-compliant. 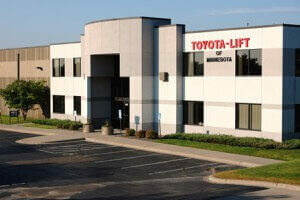 Toyota-Lift of Minnesota sells, leases, rents and repairs forklifts, construction equipment, industrial batteries and personnel and burden carriers. We have an engaged team of factory-trained sales and customer service representatives that are assigned specifically to your account. This approach ensures that we understand your needs before and after the sale. Discover the difference between Toyota Lift of Minnesota and the competition. Capitalize on the wealth of knowledge and experience our entire staff can bring to you and your material handling needs. Whether you need to buy a burden carrier in Eau Claire or you’re looking for Toyota forklift rentals in Minneapolis, we are by your side to help. Additionally, Toyota-Lift of Minnesota and our warehousing division can provide complete warehouse solutions to clients worldwide. We understand the complications of sourcing large, complex systems and the usual necessity of multiple vendors supplying pieces of the whole. Logistically, multiple sources on a single project is a real problem for the vast majority of clients. Our warehouse division solves that problem by providing true turn-key systems. Toyota Lift of Minnesota will work with the customer to create a complete system and we become one source for the complete project. Because we control all aspects of the project from design to installation, we are able to provide complex projects on time and on budget. Browse forklifts, personnel and burden carriers, construction equipment and rough terrain forklifts. When you choose a proven name like Toyota, you can expect a higher level of dependability throughout the life of your equipment. Exceptional engineering results in reduced cost of ownership—your new Toyota material handling equipment is an investment for the future of your productivity. There is no better way to save on equipment than with TLM pre-owned machines. Get the job done right with used equipment that’s nearly as good as new. Our selection of pre-owned material handling products is designed to be durable, maneuverable and safe. Get a budget-friendly solution for your lifting and loading needs. Whether you need LED lights, safety kits or maintenance tools, Toyota Lift of Minnesota can provide you with the products it takes to keep your business moving. View and download pages of our forklift safety and accessories catalog. Search for your representative to the right for more information.